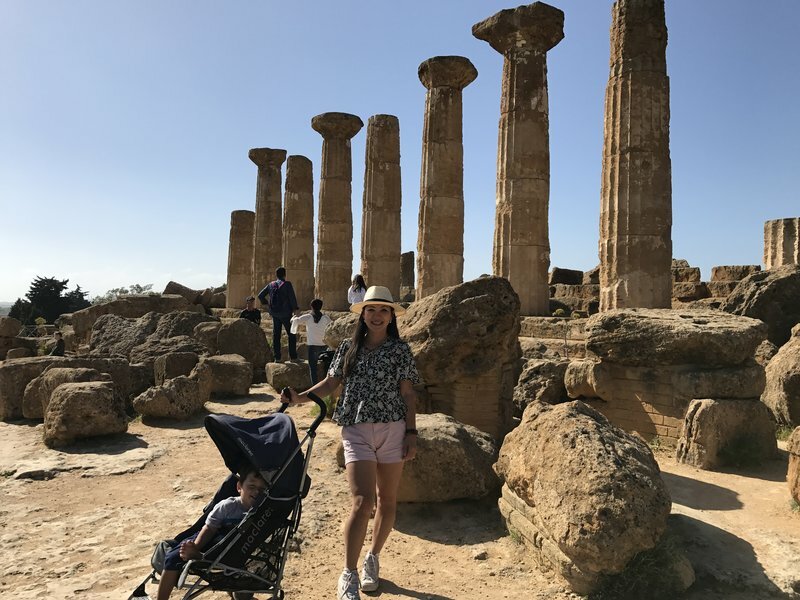 We had a smooth, uneventful drive up the southern coast of Sicily to Agrigento. 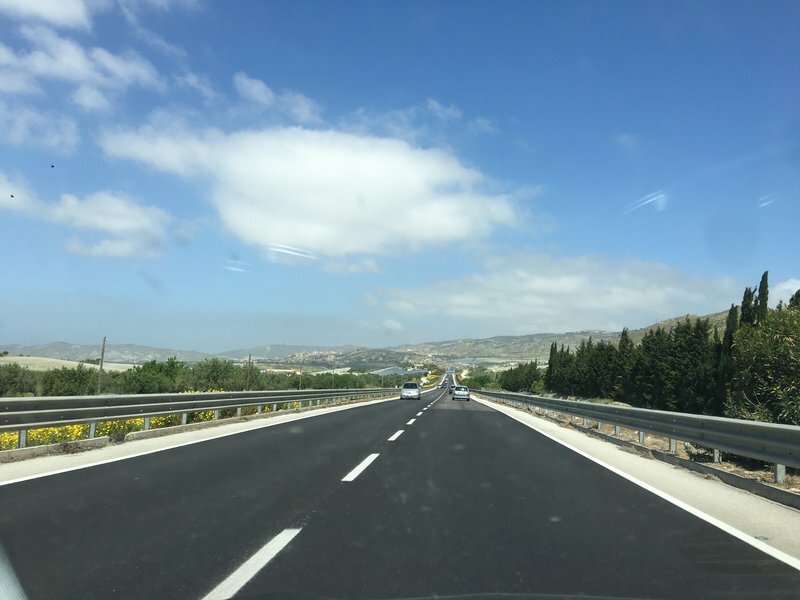 This was a well-maintained, flat stretch of highway with little traffic and pleasant views of rolling hillsides, farmland, and occasionally the coastline. 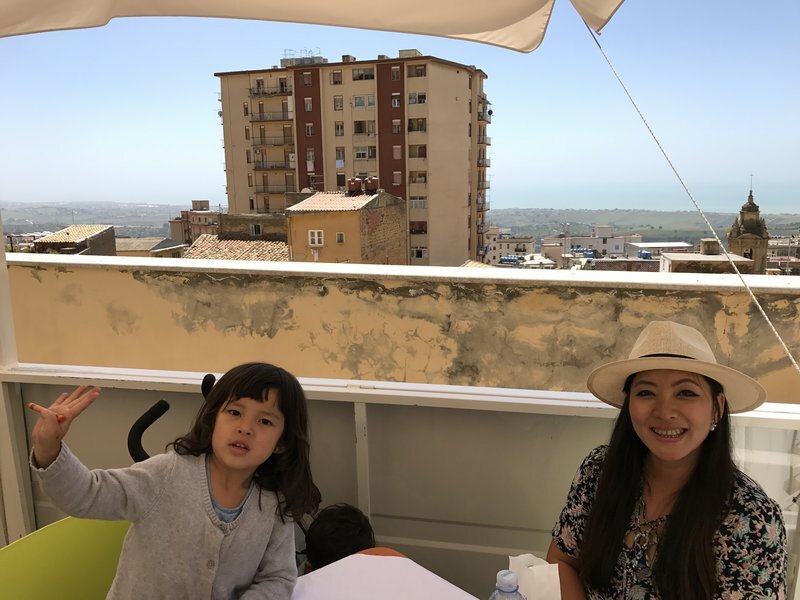 By the time we arrived in Agrigento everyone was recovered from seasickness and looking forward to lunch. Mei Ling had picked a well-reviewed restaurant in the center of town from TripAdvisor. 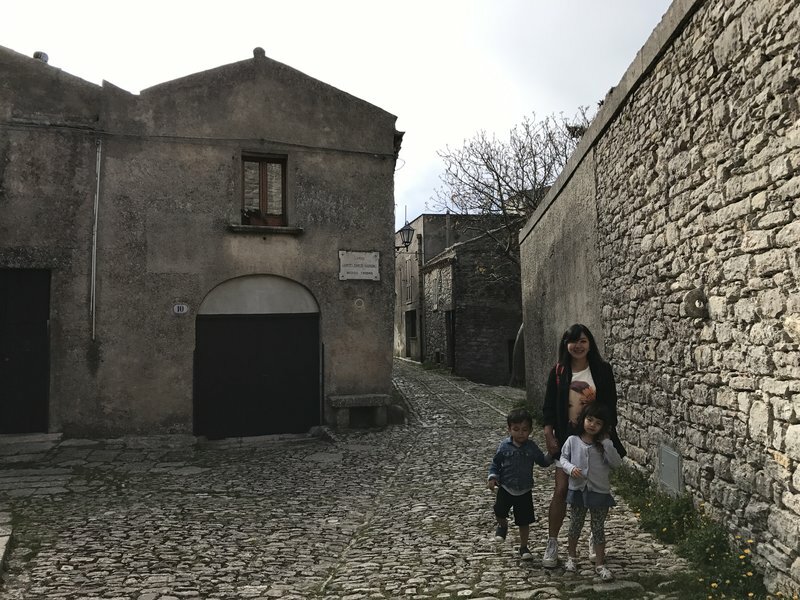 Unfortunately, either I took a wrong turn or our GPS misguided us and we found ourselves in a tangle of narrow streets, steep inclines, and dead ends. I bravely attempted to navigate through it but eventually we came to a spot where it seemed unlikely that our car would pass through undamaged. Mei Ling got out and helped me reverse the car through a very unpleasant sequence of sharp turns on an upward slope until we reached the main street again. It seems that we'll never manage to get through a European road trip without at least one experience like that, although I think we're getting better at avoiding them. I think if we'd had a minivan we never would have made it back out with both tail lights. The old town rewarded us for our persistence with several pretty churches and squares on the main street Via Athenea. Our chosen restaurant was closed on Mondays as were most of the others we passed, but eventually we found a very pleasant place with an outdoor terrace and decent food. 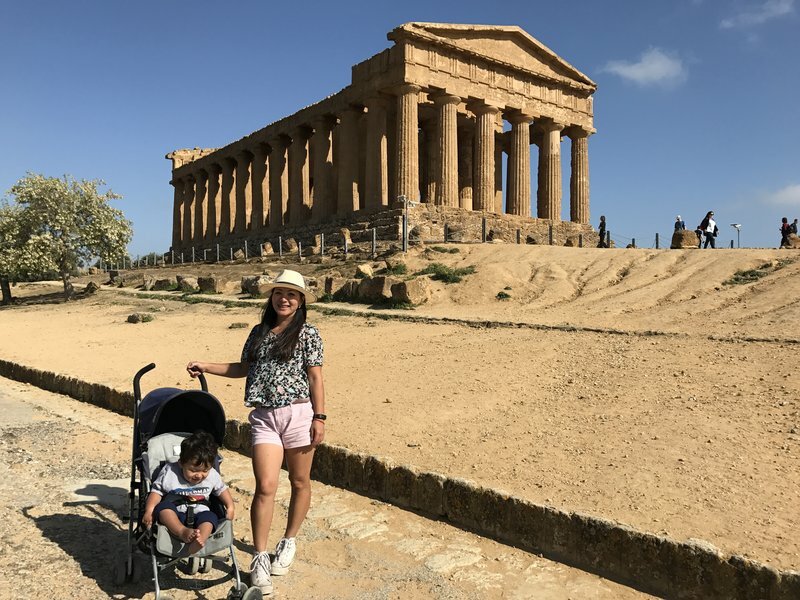 From Agrigento it was a short drive to the Valley of the Temples, probably the most famous archaeologic site in Sicily. Close to the site we stopped at a cafe on the side of the road for ice cream and views of the Temple of Hercules and the town. 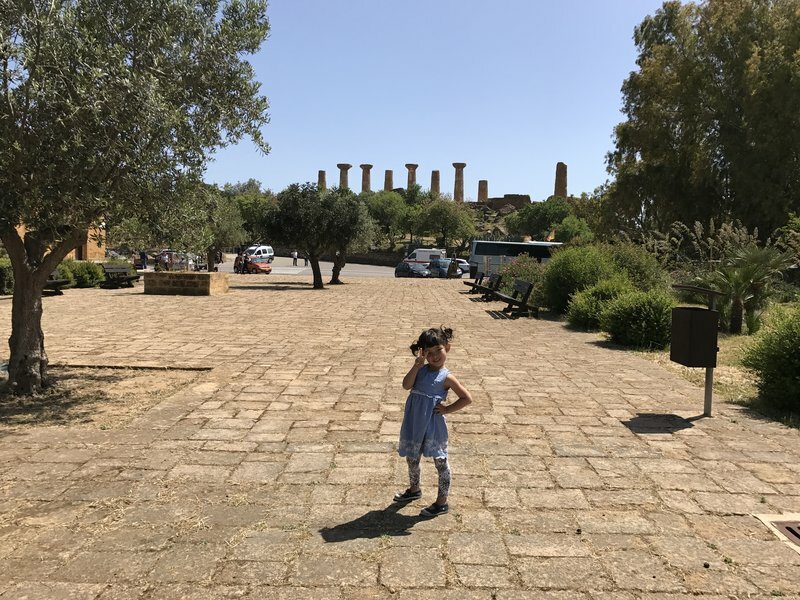 We spent a lot of energy getting Cleo excited about the temples so that she wouldn't complain about the walk, but in typical fashion she fell asleep soon after we arrived. 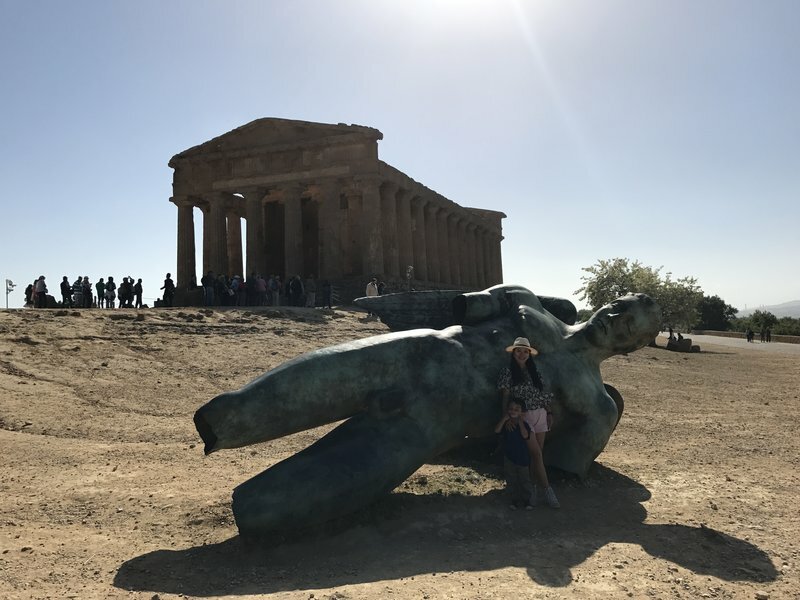 Ian ended up being the one who got to pose with the statue of fallen Icarus in front of the Temple of Concordia. It was a pleasant walk but once again I was reminded how much I preferred exploring the old quarters of modern cities to bumping shoulders with other tourists at ancient sites. We would have liked to stop at Scala dei Turchi but it was already getting late and we wanted to get an early dinner. This was the only night for which I hadn't booked accommodation in advance, since I wasn't sure where we would end up on our long drive along the southern coast. After Agrigento, Sciacca was the obvious choice and fortunately my gamble on a last minute booking paid off. 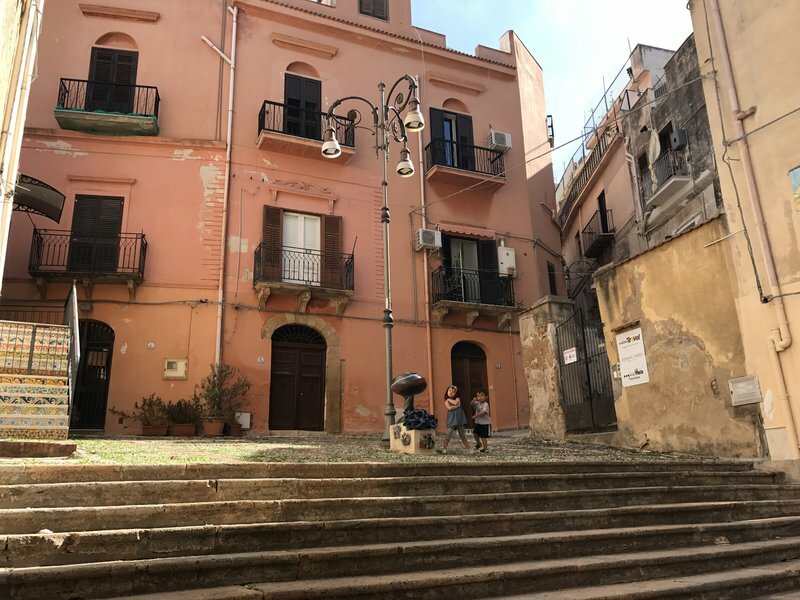 Casale La Zagara was a little hard to find, even with GPS, but they provided us with a very comfortable apartment in attractive surroundings. 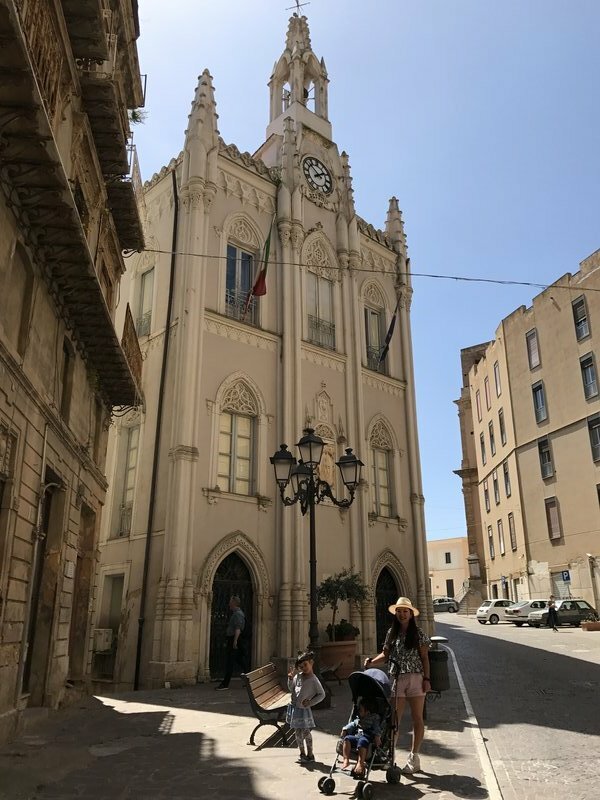 We had a surprisingly difficult time locating a restaurant that wasn't booked solid on a Monday evening, but eventually found a small place in the old town that provided a typically mediocre Sicilian restaurant meal. 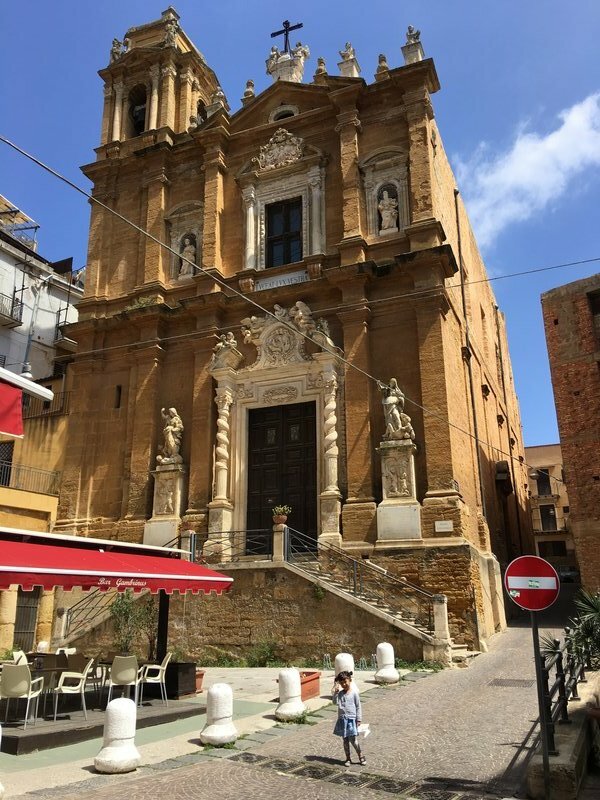 The next morning we explored downtown Sciacca. There was only one major street, unsurprisingly named Corso Vittorio Emanuele. The avenue was pleasantly atmospheric and devoid of tourists. 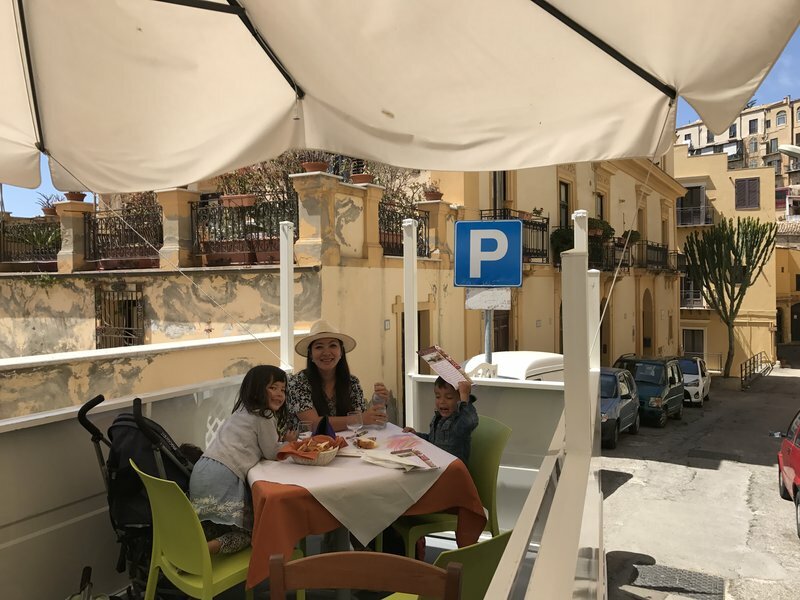 We stopped at one of the lunch kiosks in Piazza Saverio Friscia for what would turn out to be our last spleen sandwiches of the trip. 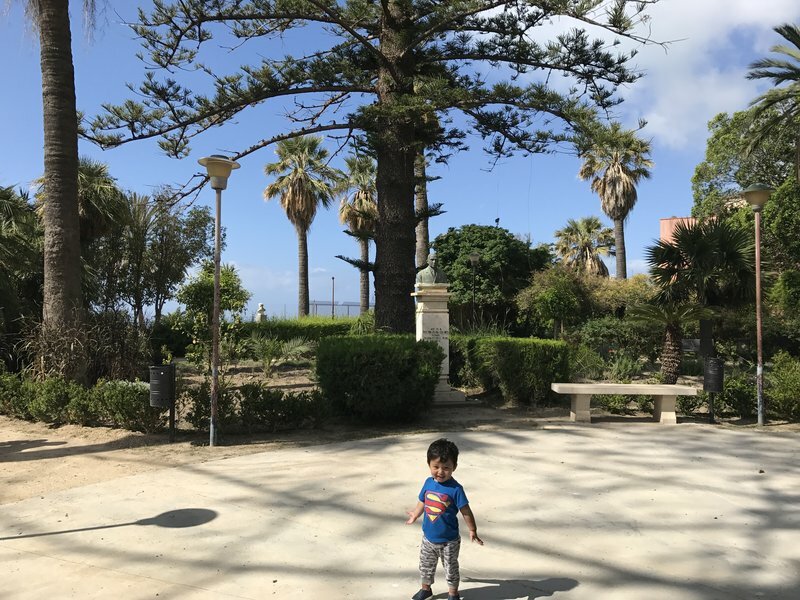 At the end of Corso Vittorio Emanuele was a small park called Villa Communale with views of the shoreline and the modern part of the town to the west. 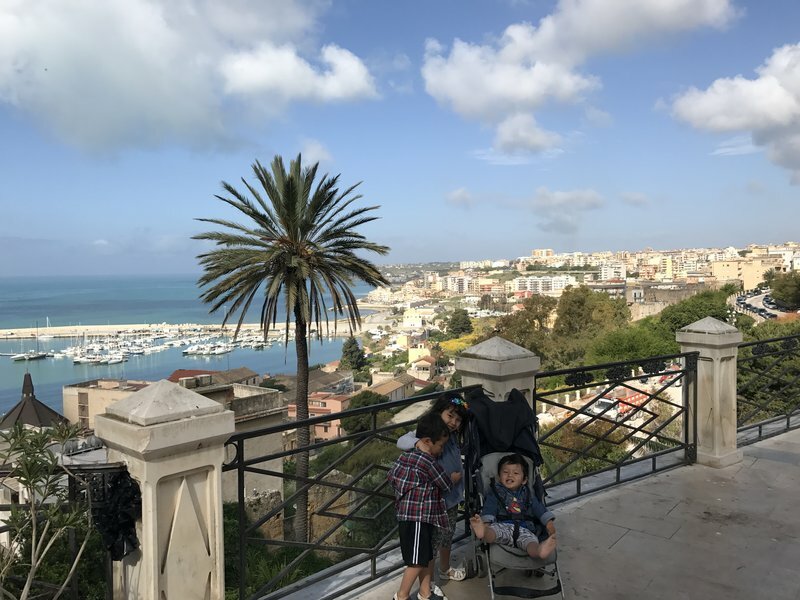 It was a good spot for the kids to stretch their legs and enjoy the Mediterranean breeze. 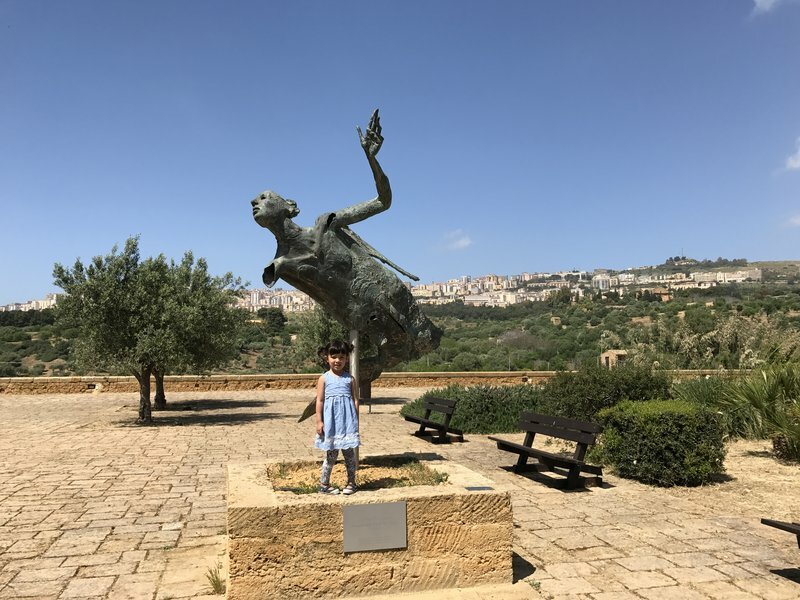 Our first stop out of Sciacca was Il Castello Incantato, a strange estate left behind by the sculptor Filippo Bentivegna. 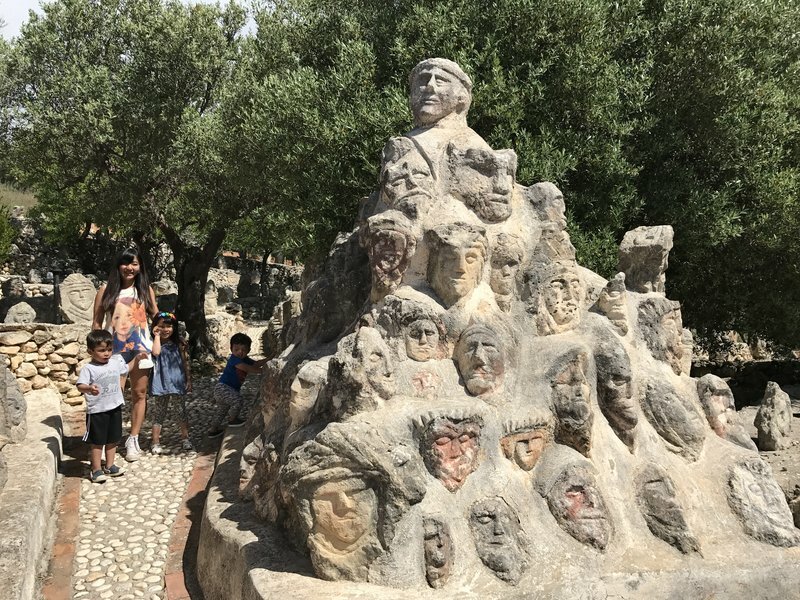 Bentivegna was an eccentric character who spent the later part of his life sculpting heads and faces out of stones he extracted from rock walls. After his death in 1967, the estate was restored and the stone heads were strategically placed along pathways and terraces. 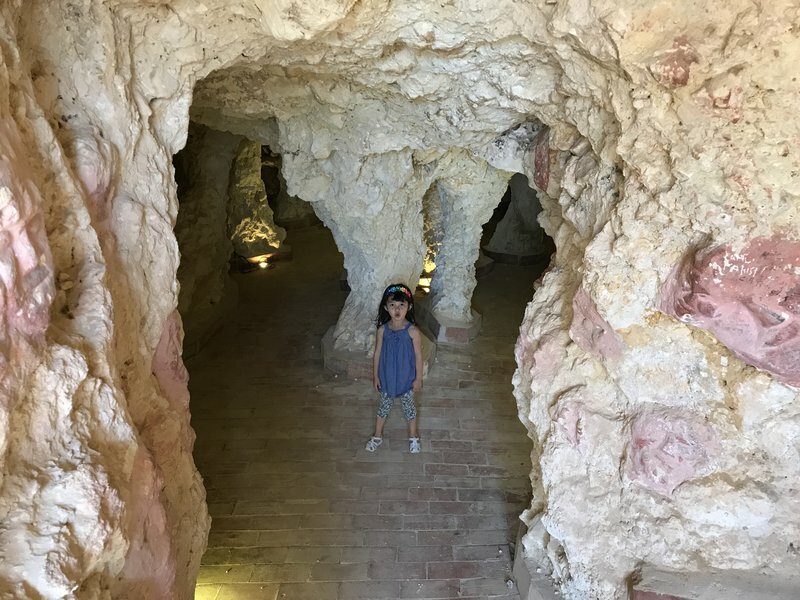 The site is full of trees and prickly pear cactus as well as a small and spooky network of limestone caves. 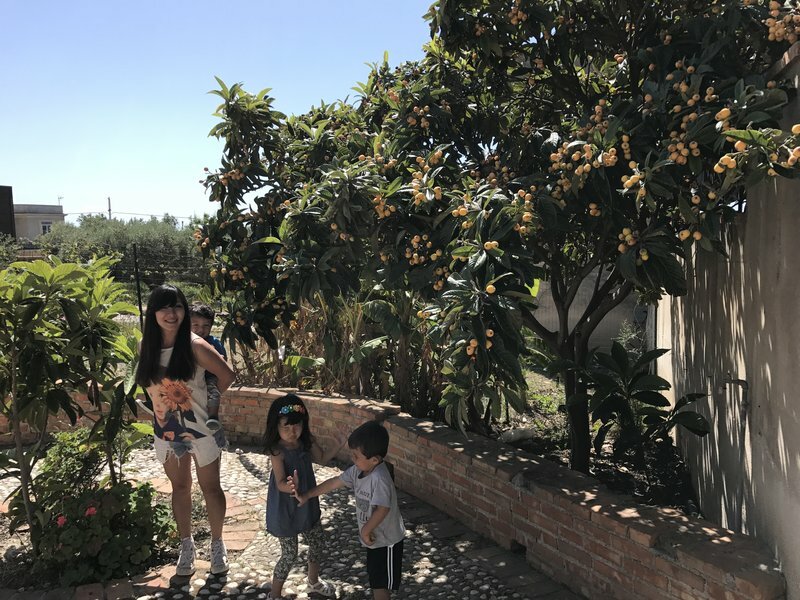 We found a loquat tree that was laden with delicious ripe fruit and spent nearly as much time eating loquats as we did on the rest of the estate. 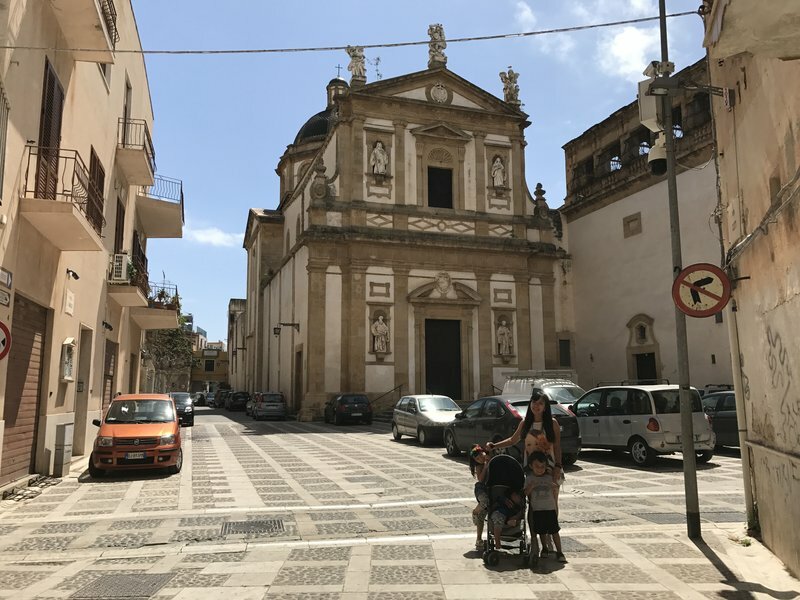 After Sciacca the highway turned inland so there wasn't much scenery on the way to the town I had picked out for lunch, Mazara del Vallo. This ancient fishing town is famous for its lasting Arabic character. 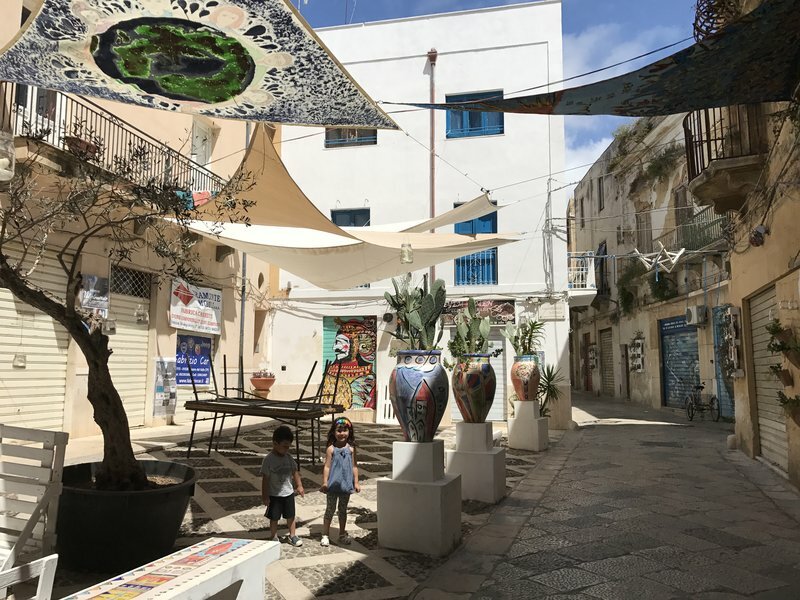 The Kasbah quarter of town is home to thousands of Sicilians of North African descent as well as more recent immigrants. 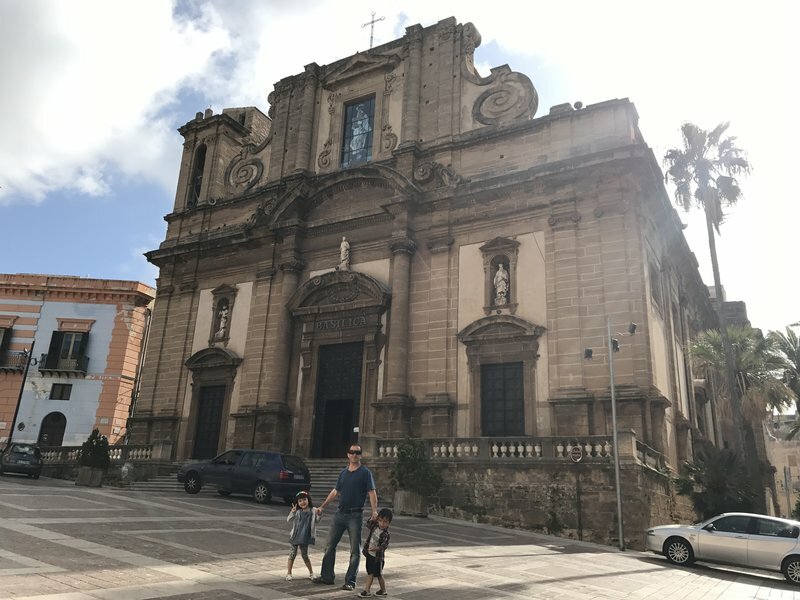 The old town was much more impressive than I had expected, with atmospheric narrow streets and beautiful churches. The Tunisian restaurant in Kasbah I had selected turned out to be closed on Tuesdays, so we had to scramble to find another place to eat. We ended up at a higher end restaurant where we were fortunately the only customers. 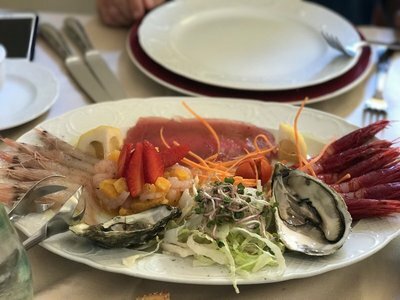 It ended up being the most expensive meal of the trip, thanks to the seafood platter and the exorbitantly-priced scarlet shrimp. Our last major destination of the trip was also one of our most highly anticipated. 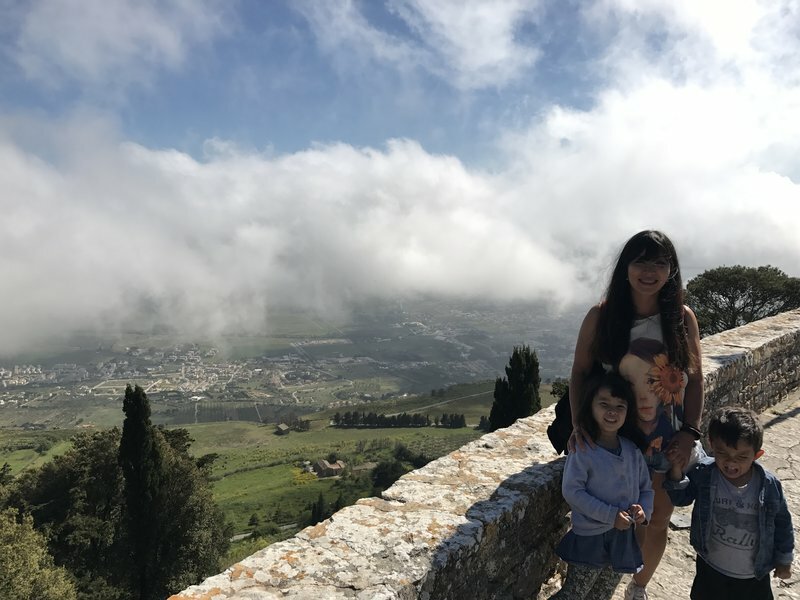 The mountaintop walled town of Erice is on every must-see list for Sicily. 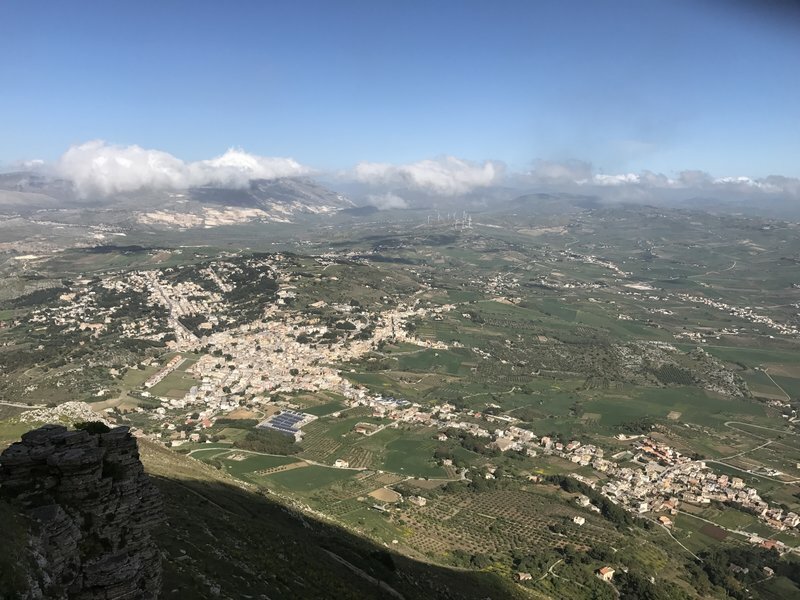 Instead of driving the winding road up the mountain, I elected to take the cable car from Trapani. I had been warned about the scam artists at the parking lot who falsely claim the lot is closed and demand payment for parking elsewhere, so I wasn't surprised to see some sketchy characters sitting on the curb outside the entrance. I didn't even make eye contact as they jumped up and started shouting at me as I drove into the lot. 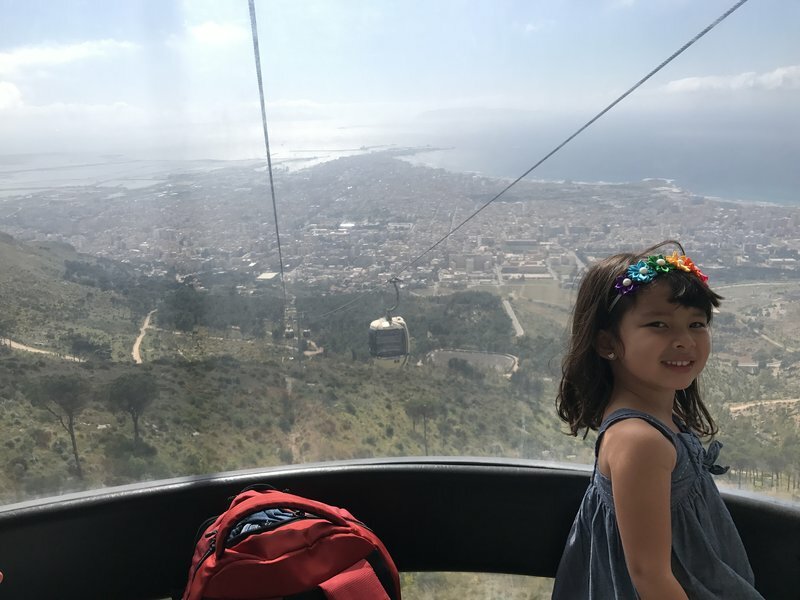 The cable car turned out to be the right choice, as everyone loved the views over Trapani and the Mediterranean as the gondola rose into the clouds. 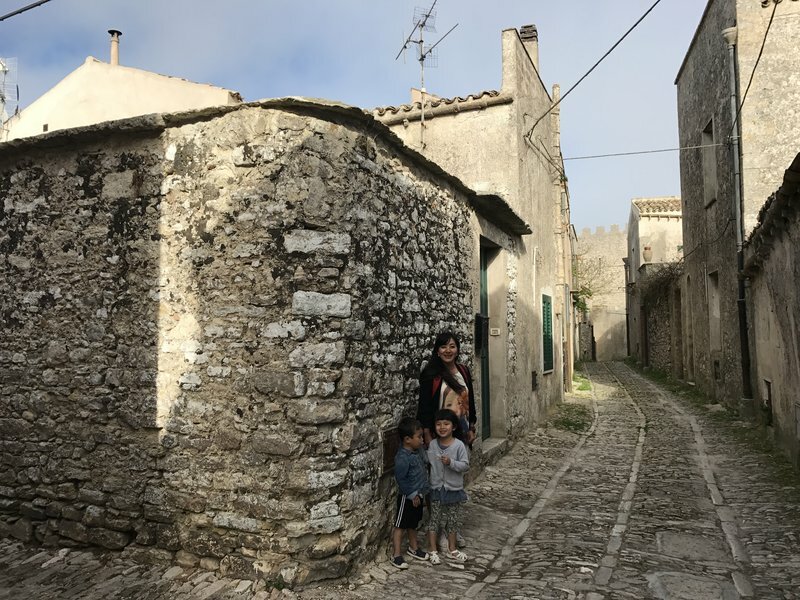 Once we got off the cable car in Erice, we walked straight to Castello di Venere via Viale Conte Pepoli just outside the city wall. 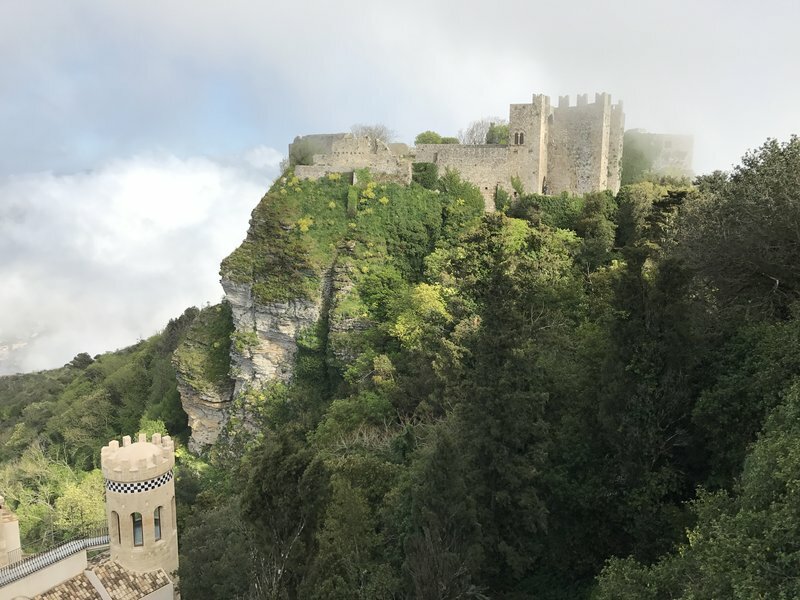 We had amazing views of the green countryside below us through the clouds, as well as the castle up ahead. 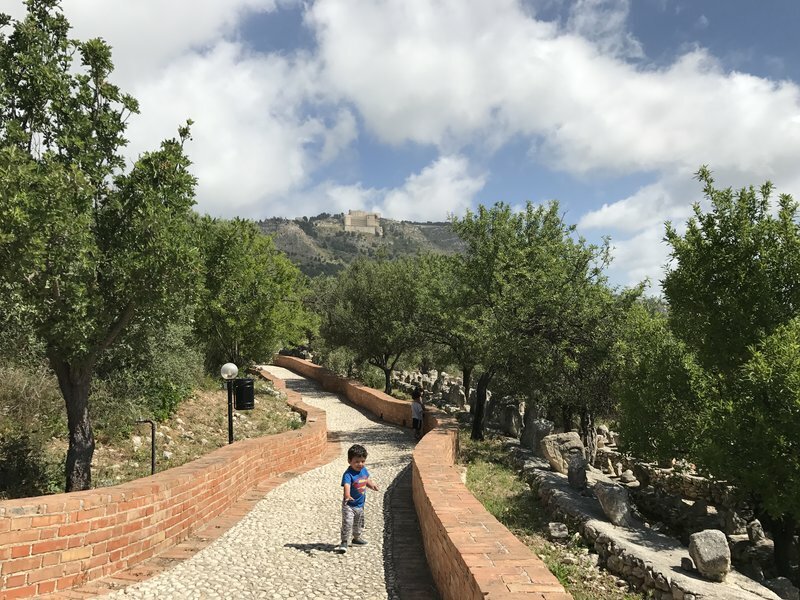 Every castle and mountaintop village we had seen in Sicily so far had its own unique character, from the noble ruins atop La Rocca di Cefalu to lively, modern Castelmola. 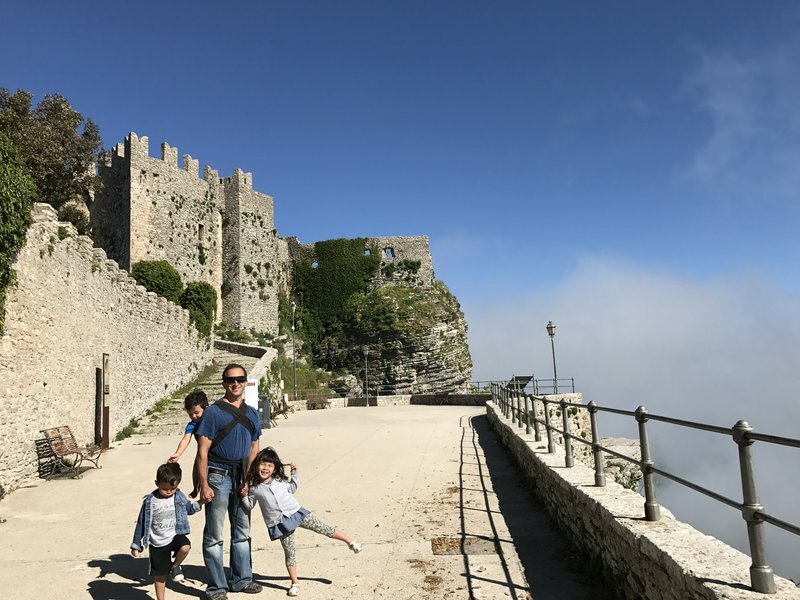 Nothing that we had seen compared to the incredible views from Castello di Venere. To the east we could see the town of Valderice as though we were looking out the window of an airplane. Further to the northeast was the hulking mass of Monte Cofano at the shoreline. Just to the north we could see two other beautiful castles, the Torri del Balio and below it the relatively modern Torretta Pepoli. 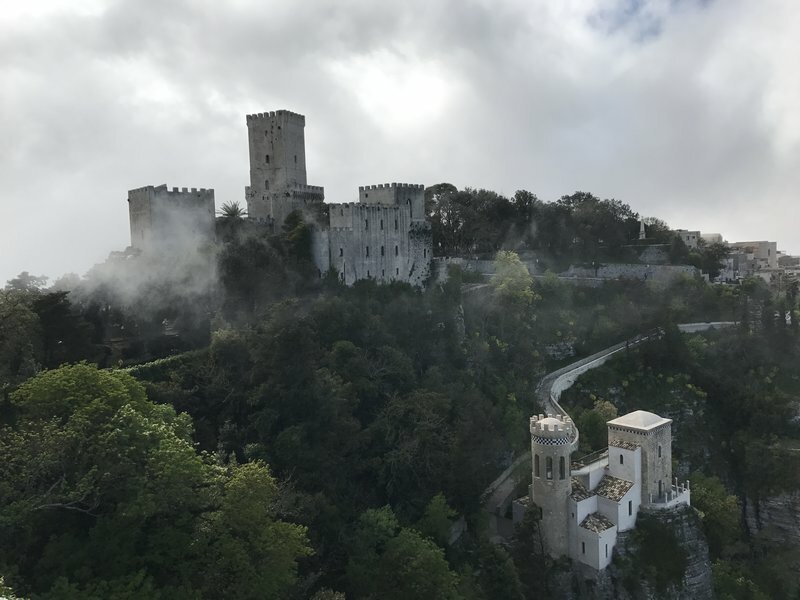 We stopped at a viewpoint close by the Castello di Venere for a look back at the majestic ruins perched on the tree-covered precipice. 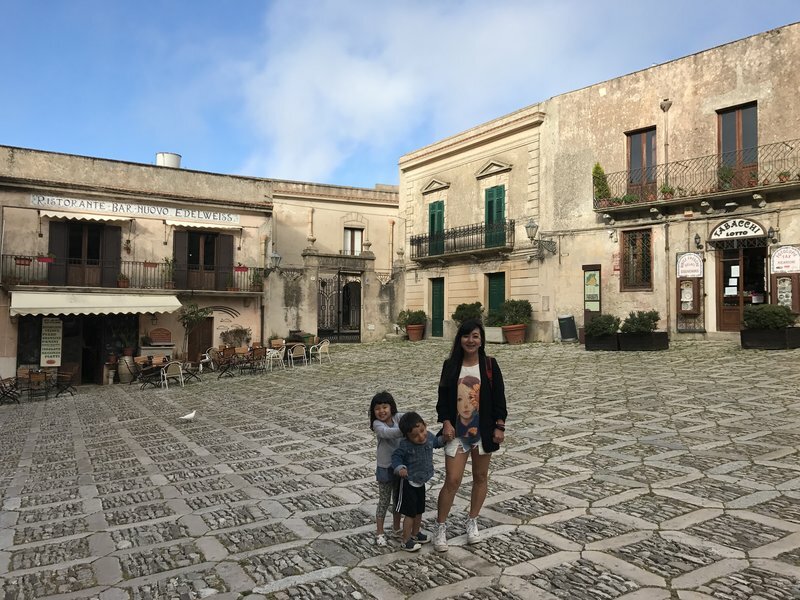 Having sated ourselves on clifftop castles and amazing views, we plunged into the triangular maze of cobblestone streets within the walled city. It was clearly a touristy place, but once again the time of year and our late day arrival worked in our favor. We had the streets and squares largely to ourselves. 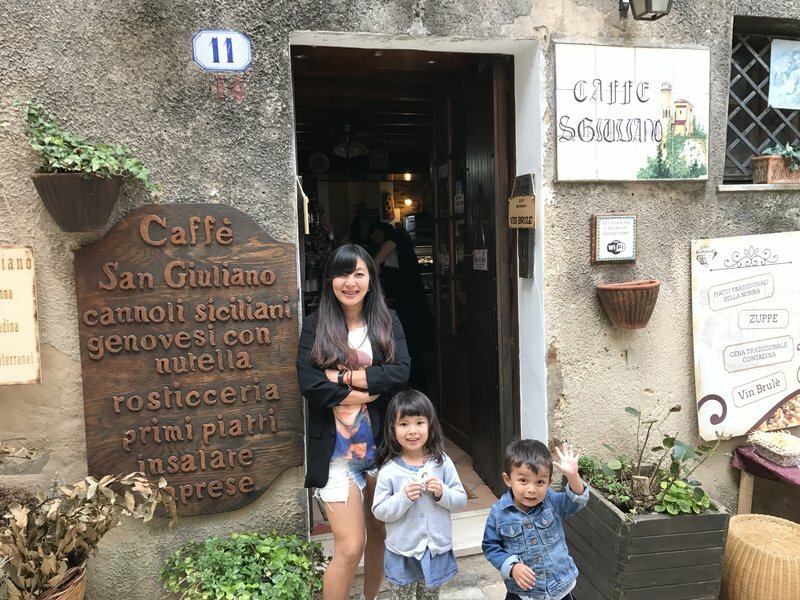 We stopped at Caffe San Giuliano for snacks and mulled wine, and were treated very kindly by the proprietors. Cleo and Ian were shocked when the owner bounced what appeared to be a brown egg, but was actually a rubber ball, on the floor in front of them. 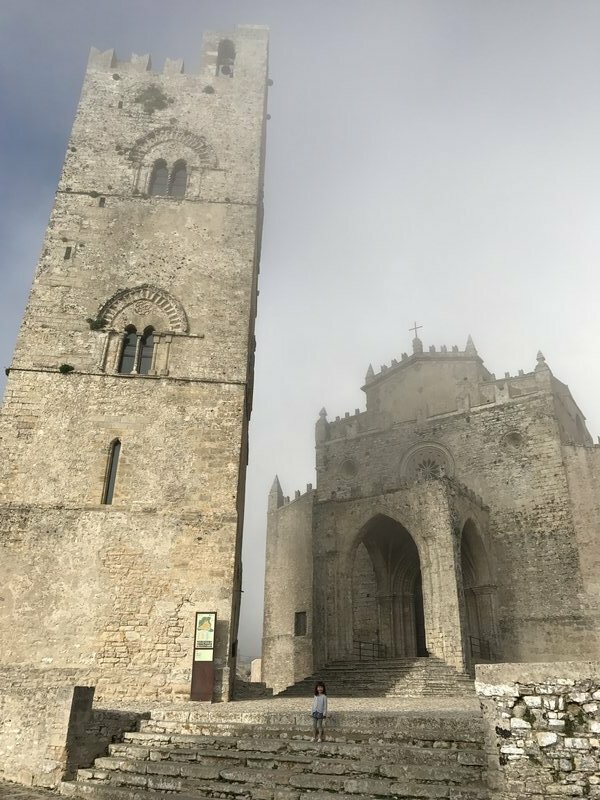 By the time we reached the 15th century Chiesa Matrice near the cable car station, the sun was starting to go down and an ominous fog was rolling in. Cleo looked like a little bug next to the imposing Norman edifice. 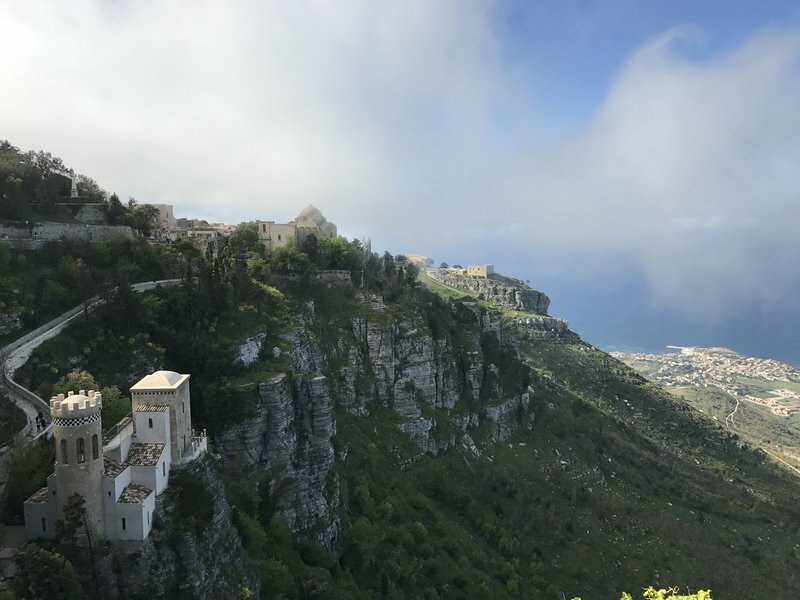 Erice was a fitting conclusion to our amazing two week tour of Sicily and Malta. There was only one important task left, which was to find a memorable final dinner. 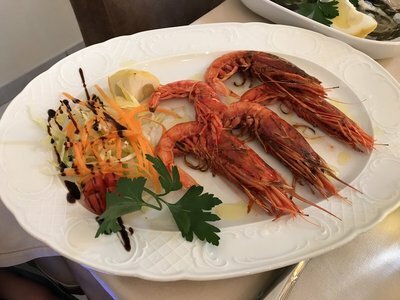 Fortunately, the top-rated restaurant on TripAdvisor in all of Trapani Province was on the way to our Airbnb near the Palermo Airport. I Sapori Siciliana turned out to be a grill combined with a butcher shop and a beautiful delicatessen. The meat was quite good, although I was skeptical that a better restaurant couldn't be found in all of Trapani. Of course, TripAdvisor is a very flawed method of choosing the best restaurant given the way it incorporates people's biases towards inexpensive comfort food. Nevertheless, when traveling quickly through an unfamiliar area it's really the best tool available. We spent the usual restless final night in a very basic Airbnb in Terrasini, and dropped the car off at the airport early in the morning. 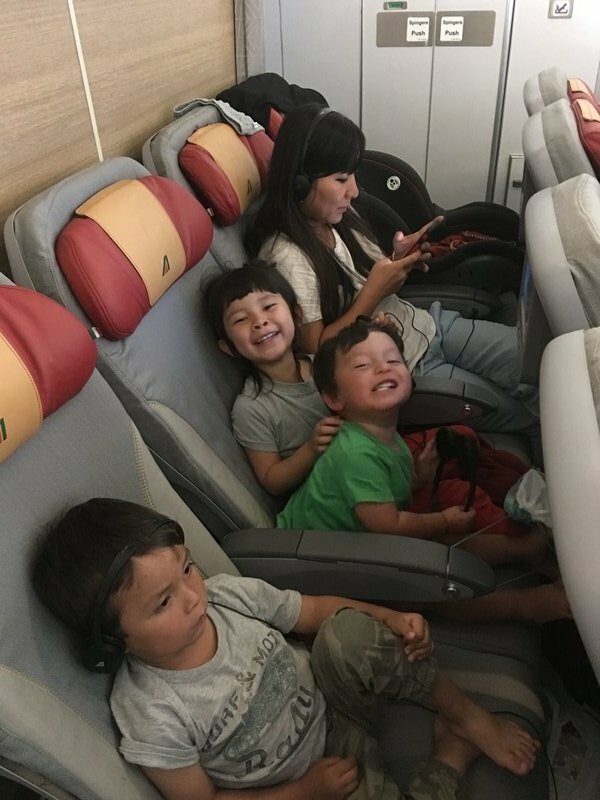 Alitalia did their very best to ruin our trip back to Miami. 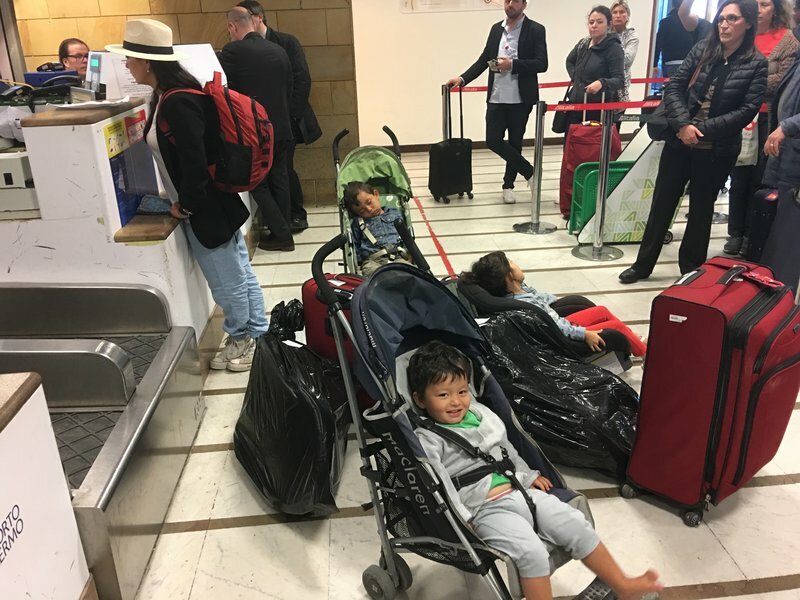 Their agents were so slow to check people in that the flight to Palermo took off forty minutes late, and once on the tarmac in Rome they couldn't seem to figure out how to get the passengers from the tarmac to the terminal. 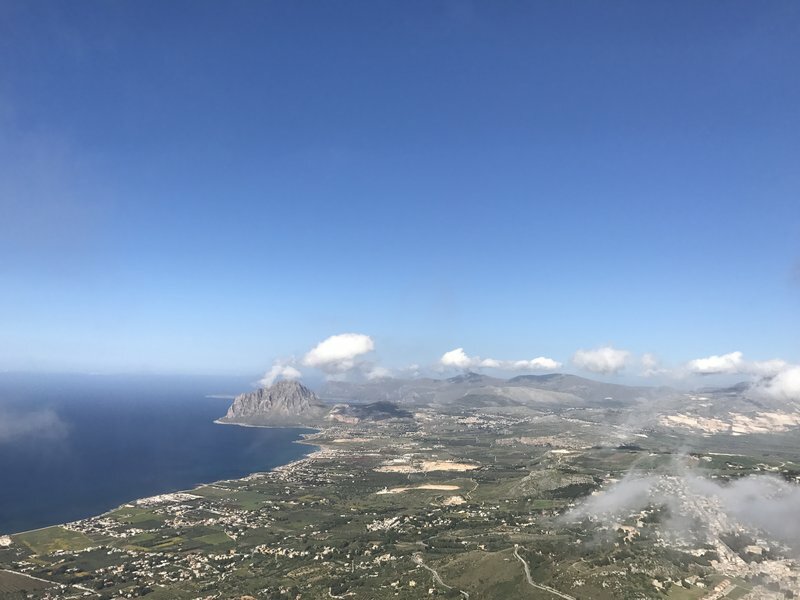 All of this incompetence was naturally accompanied by the casual rudeness we learned to expect from Alitalia employees from our arrival experience. Eventually we made our connection by a hair and settled in for the ten hour flight back to Miami. 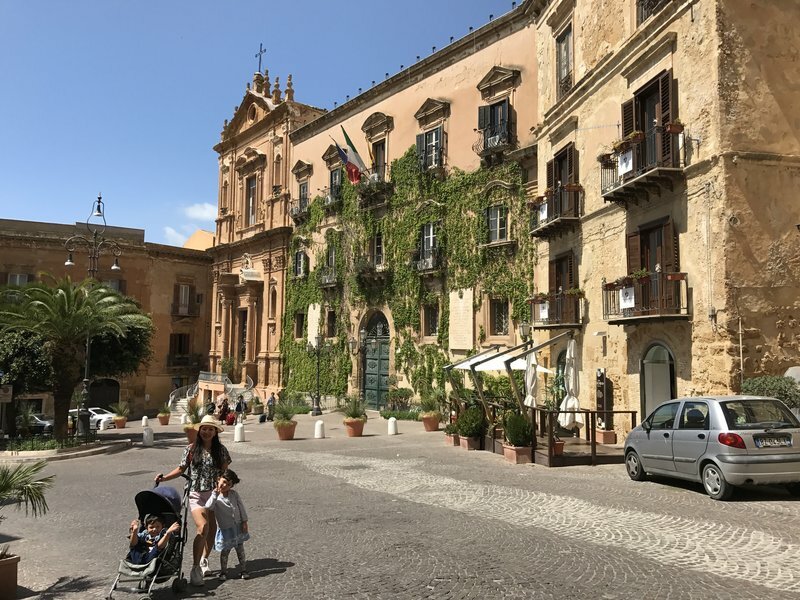 The Sicily adventure was one of our most enjoyable European road trips to date. In retrospect there probably isn't much I would have changed. A few extra days would have been nice of course, but we maxed out the time I felt comfortable taking off work and taking Cleo out of school. 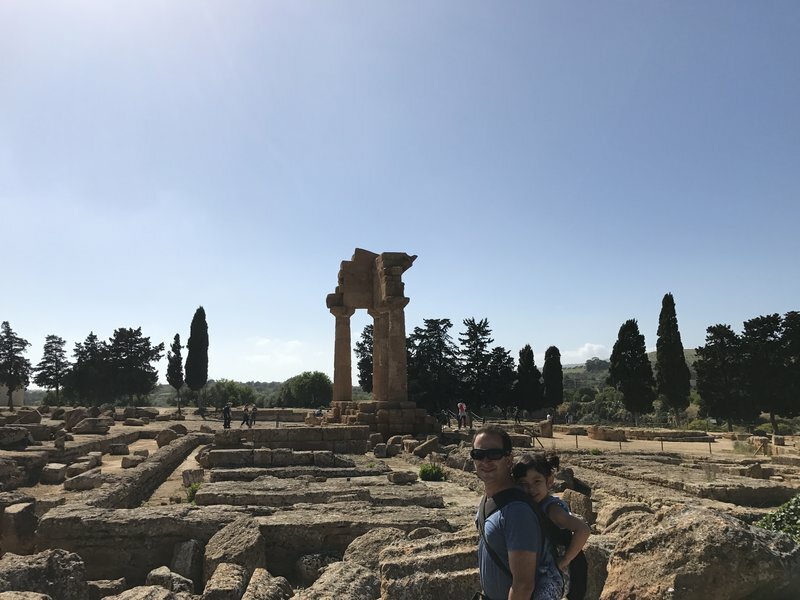 Sicily is a difficult task for a short trip because the top sights are scattered around the island. 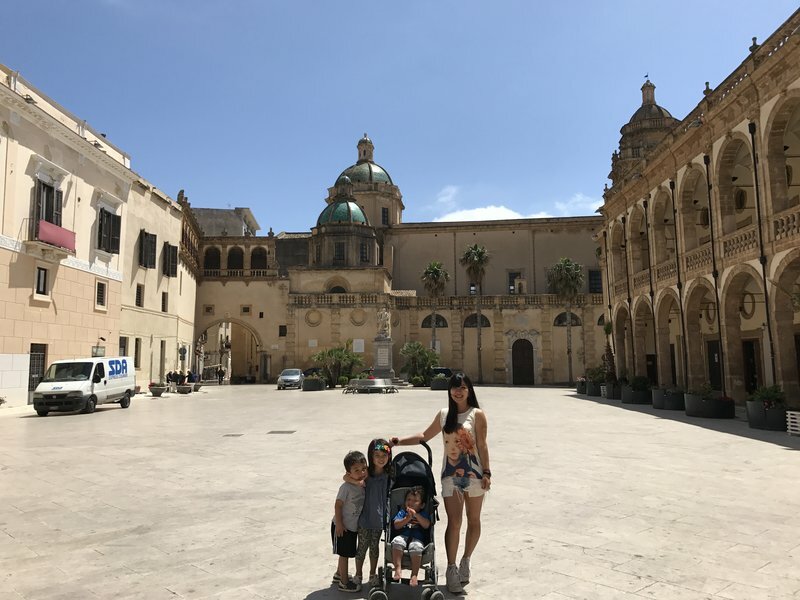 No trip to Sicily would be complete without stops in Erice, Palermo, Taormina, Siracusa, the Baroque cities, and the southern coast. 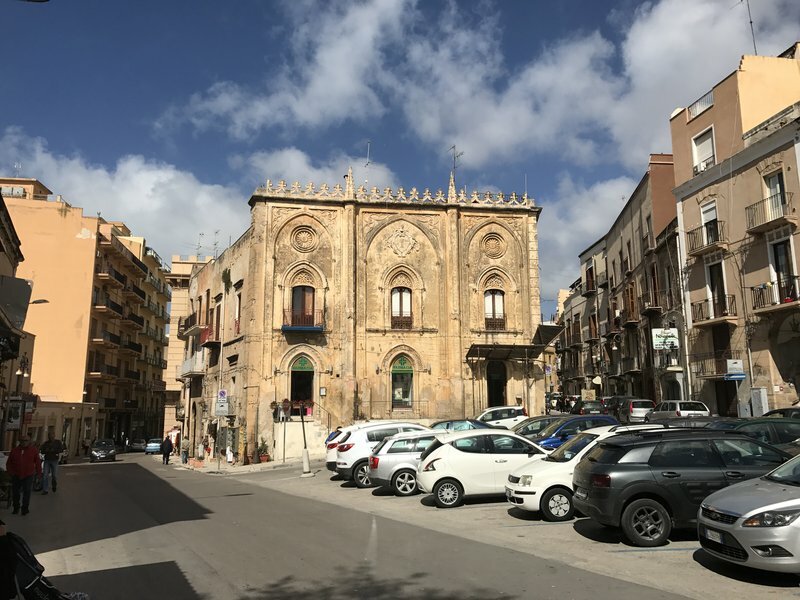 I loved inland Sicily and Catania as well, although these rarely make the lists of top tourist attractions. One problem we have on these trips is the restaurants. 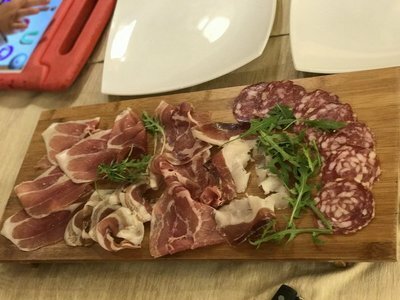 No matter what we try, we can't seem to find those epic meals that we expect in countries like Italy, France, and Spain. 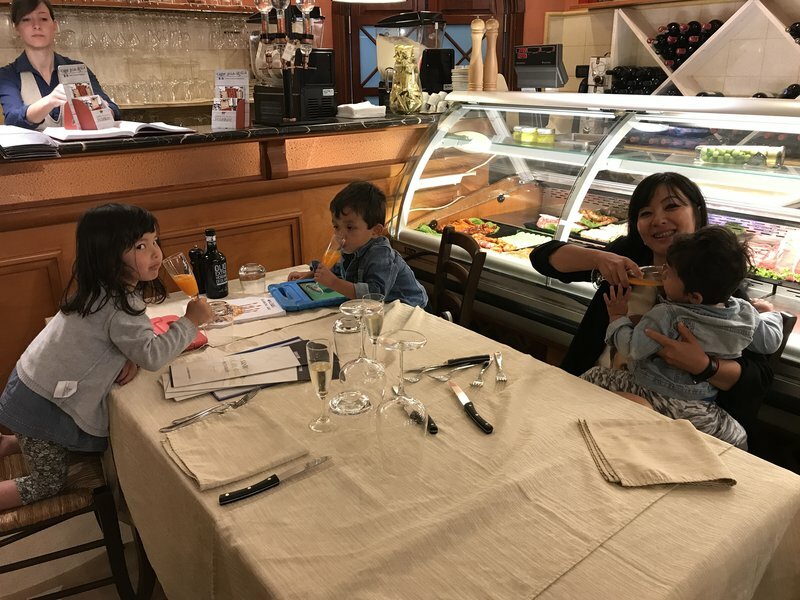 With the kids we can't go for the Michelin stars, but it still surprises me how seemingly well-regarded casual restaurants fall short of our expectations. 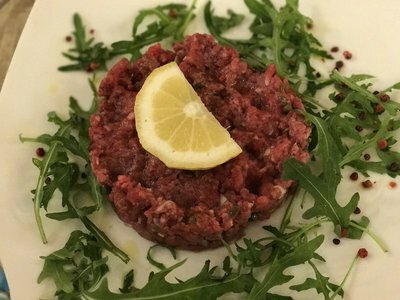 Our standards aren't unrealistic - there are several very authentic Italian restaurants in Miami that I find preferable to virtually anything we've found in Italy itself. Don't even get me started on the amazing Italian restaurants in Boston and New York City. So how does one find these places in Italy? I guess we'll just have to keep going until we figure it out.